We raise 100% grass fed beef. Yep, 100%. Not started on grass then finished with grain. 100% grass fed, 100% of the time. What makes grass fed beef so great? Grass fed beef is higher in omega-3s, Vitamin E and CLAs as well as lower in fat and calories than grain fed beef. Our registered Black Angus cows are out on pasture year round enjoying the forage and hay that the North Olympic Peninsula provides. In the spring, summer and fall, they rotate to a new pastures in order to provide them with the highest quality forage available each day. In November we take them to the winter pasture when they have free access to quality hay and give birth to their calves. In March, they head back out to the summer pastures where the cycle starts again. With the help of the Clallam Conservation District, we developed a conservation plan and now have one of the most intensive rotational grazing systems in Clallam County. This system allows us to produce tender, flavorful beef as nature intended. We are happy to reserve a portion of 100% grass fed beef just for you! -Our beef is available in whole, half or quarter orders at $3.75/pound hanging weight. * Because of our commitment to humane practices and quality meat, all of the slaughter is done professionally on our farm at $120 per whole animal split accordingly between buyers of that animal. (For example a person purchasing a half would pay $55 for the slaughter.) The carcass is then taken to the butcher where you select the cuts, seasonings and cures that are just right for your family. -There are three costs involved when purchasing meat from our farm. 1) The cost of the meat itself paid to the farm, ($3.75/lb hanging weight for beef). 2) The cost of the on farm slaughter ($120 per whole beef split accordingly). 3) The cost of the custom cut and wrap paid to the butcher shop ($.85/lb). -Below is an cost breakdown example of a half beef. 73% of hanging weight received as table cuts = 226.3 lbs = $6.57 per pound of table cuts. -It is important to remember that the price for your table cuts applies to ALL of your cuts so you are getting your ground beef and your T-bone steaks for the same price. -Contact us today to reserve your family’s 100% grass fed beef. *Note on ordering a quarter beef. We are happy to split a side of beef into a quarter for you and your family. However, please note that the butcher charges an extra $.10/lb to split the side. This comes out to about an extra $15 per quarter. Therefore the cheapest way to get a quarter beef is to find a friend to split the costs with and divide the cuts yourself. We are now taking reservations for Fall 2019 beef. If you are interested in purchasing beef or other meats, please fill out the following form and we will get in touch with you regarding our availability. *Deposits for beef are: 1/4 beef-$150, 1/2 beef-$300 and whole beef $600. Thank you for you interest in our farm and our beef! What cuts will you get with your beef order? 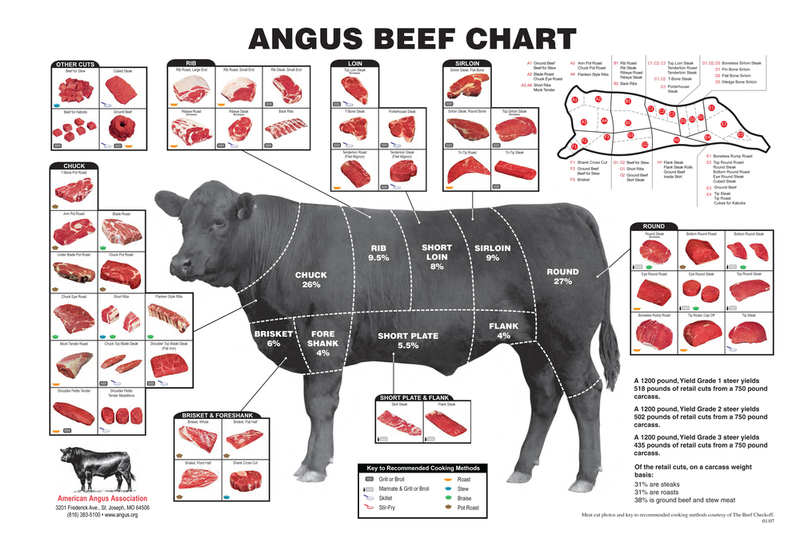 The chart below shows the options available for each part of the beef. How much of what cuts you get are up to you!